Owner of Pretty River Woodwork based in Ottawa, Ontario. He spends his time fussing over every tiny detail of a project, seeking perfection. On days off, however, he spends time camping, skiing and relaxing with his girlfriend and cat. In a small apartment, counter space is at a premium. 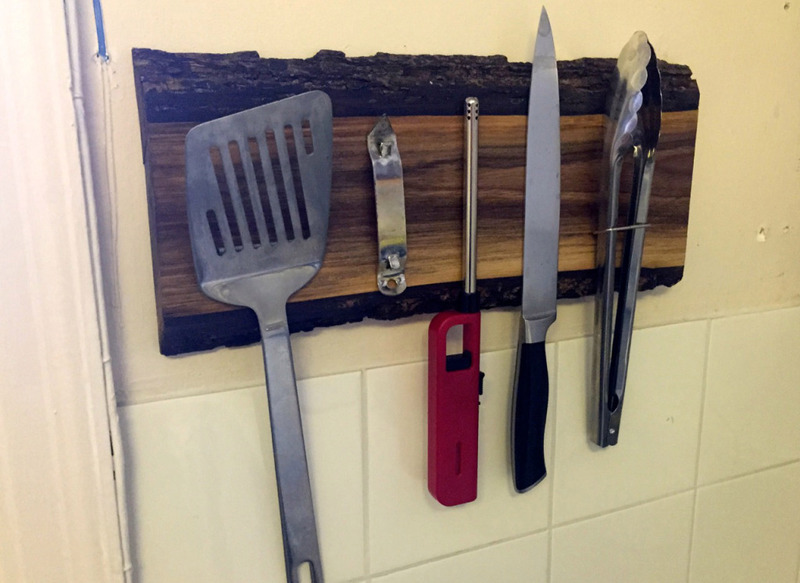 Knife blocks are huge and often unsightly, so I resolved to make an attractive, convenient solution. Several people commented that they would pay for such a product, so I opened Pretty River Woodworking on Etsy. As a second personal project, I needed a space to store my barbecue utensils. Here’s the Black Walnut barbecue holder. 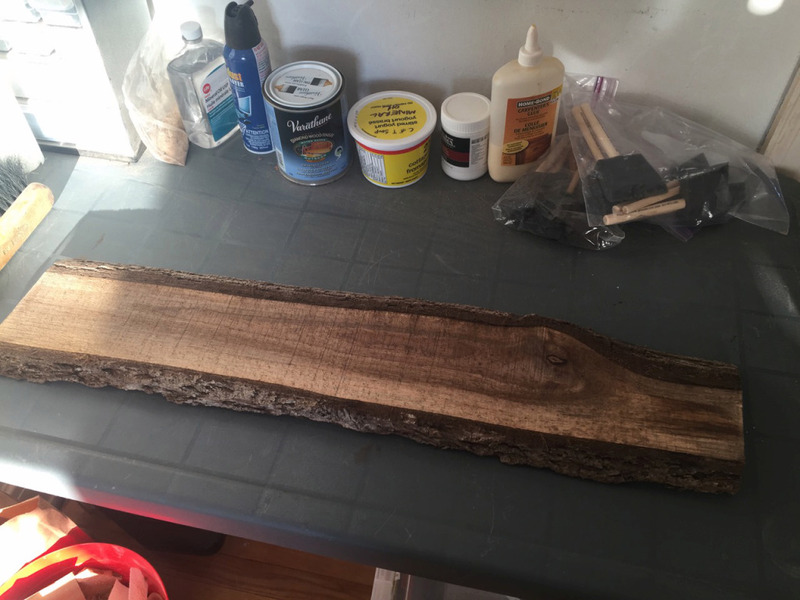 I started with a rough cut black walnut board. It was harvested locally and special care was taken to preserve the bark for a natural look. 1) Sanding out the mill marks lets the grain and texture of the wood show. 2) I finish sanding to 120 grit on both sides. 3) Often, the wood stock is very rough and needs to be squared. I don’t have any square edges to provide reference, so I have to be very careful with the saw. 4) I use a fine toothed blade to produce a clean, finished cut. 5) I use a level to ensure the sides are parallel to each other. 1) These are the tools I use to layout the hole locations on the back of the board. 2) Layout out the locations for ten blind holes. 3) I use a 1” Forstner bit, and have to remove the pilot tip first. 4) Using a grinder, I remove the tip so I can drill a square bottom hole without poking through the other side. 5) The Forstner bit is mounted in the drill press, and a 1/16th” thick ruler is used to set the depth-stop. 6) Spring clamps hold the wood in place, and the depth stop prevents me from drilling too deep and going right through the other side. 7) The deeper the hole, the stronger the magnetic pull through the opposing side. 1) These 1” diameter rare-earth magnetics (neodymium) are extremely strong. One of the hardest parts of this project is separating them from each other! 2) I test out the strength of the magnets through the wood using a heavy knife. If it isn’t strong enough, I try to drill further down, or double up on the magnets. 3) With the magnets in place, I take a measurement of the depth. This will be the length of my cut dowel. 4) I use 1” oak dowel to plug the back of the hold. This traps the magnet in place, and provides a finished look, front and back. 6) A dab of wood glue holds everything in place. 1) I sand the plugs flush to the surface of the wood. This also removes pencil marks from the layout. 3) Poly varnish forms a glossy, durable surface so the product. I use 10 coats on the face, 5 for the edges and 3 coats on the back. 4) It has to cure for a few days while the varnish hardens.